While there are plenty of man-made Austin, Texas attractions, the best by far are the natural areas of the Texas Hill Country. The trails are winding, and the views are stunning. 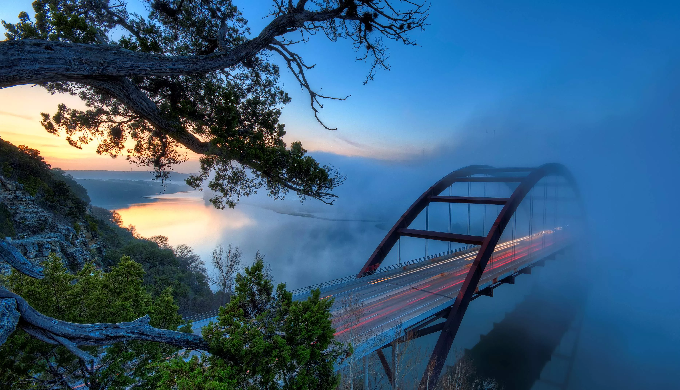 So if you’re looking for things to do in Austin, or near Austin, go on an adventure and experience these 5 purely breath-taking views in the Hill Country. You can watch the sun rise on a beautiful Austin morning. The faint view of the cars driving on the bridge will help to make this view even more magical as you watch the sun rise or set. Experience the sheer breadth of the star-filled sky of the Texas Hill Country. On a moonless night, the sky comes to life with millions of stars. There’s nothing quite like the view of Enchanted Rock and its reflection in the water. The view from the top of enchanted rock is equally as entrancing. The beautiful view of the olive groves is only multiplied by the even more serene view of the rolling hills in the background. Watch as the wind blows through the groves causing them to sway back and forth as if it were a sea of luscious greenery. When it comes to views from a high elevation, nothing trumps the view from Edwards Plateau. From that height, the Texas Hill Country seems to go on forever. When it comes to things to do in Austin, you can’t beat getting back to nature! The Texas Hill Country is full of amazing views, but these are 5 of the absolute best! The master-planned community of Caliterra in Dripping Springs is the Gateway to the Texas Hill Country. Visit our website and see how Caliterra living makes you feel at home with nature.